Company Five Ways Software Ltd.
7.47 points at 19 votes (rank 218). Somewhere, in a dark and dangerous area where no man has ever set a foot, is an old enchanted castle in which a creature lives that is known as the "ill-tempered Thing". 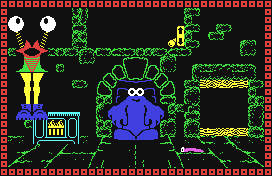 In the cellars and vaults lives a servant, a loveable blue monster named Berk, who works as cook for the "Thing" and thus tries to get the ultimate reward: the safe! Berk needs to correctly accomplish five tasks (four in the learner mode) and he has only limited time for this or otherwise the "Thing's" anger will get too big. Each task is seen as accomplished when Berk has sent his "offer", which is what he has mixed together, upstairs with the lift and the "Thing" finds it acceptable. As a first task he e.g. needs to fill a can with worms. Further comrades in this funny action adventure are Boni (the talking skull), that gives him the instructions and Drutt, the spider, that likes to eat worms. 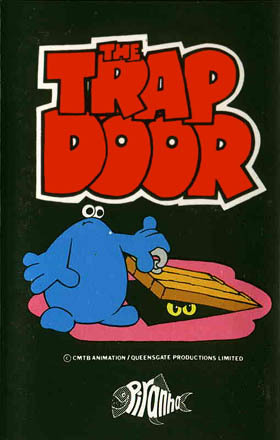 Trap Door is basically an intelligent action adventure with a pinch of skill and a lot of creativity. You can do anyhing that is possible and impossible. The game is shown in pseudo 3D view in several screens. Berk can also be moved "into the depth". The acting monsters are big and funnily animated. The controls are done with the help of the joystick or by arbitrary keyboard controls. Below the trap door lure many monstrous creatures and only wait for it to be opened to escape. Some play an important role in the task that Berk needs to accomplish at the moment. The problem is, that Berk does not know which one is the right one. When the wrong one is released, it can turn out to be a troublemaker or even be dangerous. When a ghost flies through the open trap door you can be sure that it is hungry, as everything in Berks world, and the only way to get rid of it is, to feed it. Ghosts eat everything, worms, eggs, eyes and even Boni, the skull. In the learner mode, the ghosts are sent on holiday and do not appear. Boni is an utterly erudite skull. Eacht time Berk picks it up, it will utter some words, sometimes it gives good advice about the preparation of a recent recipe. 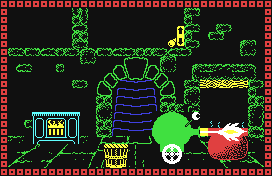 Drutt the spider (which is actually a frog in disguise) spends its time with jumping around aimlessly, eating worms and being in Berk's way. They all can be solved! The "Thing" will speak up after a short time and utter its wish. The ingredients can all be found in the lower regions, you simply have to find out how to use the different objects and what they contain. 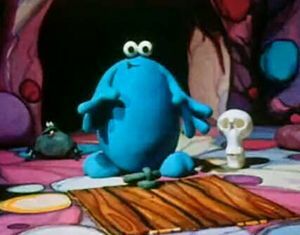 Each task requires a special "Trap Door" monster to be finished, so a monster that is below the trap door. The anger meter at the side of the screen shows how much time you still have. When the time runs out without finishing the preparation, the task is not accomplished and the "Thing" will utter a new wish. Berk can push around objects and this object can also move other objects. Berk can fill stuff into containers, carry those around and empty them again. Some containers are necessarily required for different tasks. The points that you get decrease the longer you take and are raised by bonus points for good execution. At the beginning of the game you can choose between Learner-Berk and Super-Berk. At the start you should chose the learner mode, as it is easier to play. However, you get less points and the "Thing" does not send a safe. The key assignment can be chosen at the beginning, additionally, Berk can be controlled by joystick. You can move Berk forwards, backwards, left and right so that the impression of spatial depth is created. When Berk's hands are free, he picks up objects when being close to them. To move an item you place him slightly left or right next to it. The "Drop" key is used to place things behind Berk and the "Tip" key to pour contents of a container in front of him. You can trip levers by placing Berk so that he can reach them with his hands. Take the can (4) from the kitchen and put it in the room with the trap door (10). Shortly open the trap door with the lever (8) the set the worms free. Collect these before Drutt eats them and put them in the can (4), three are needed. When too few are there, simply open the trap door once more. Place the can with the worms in the lift (15). 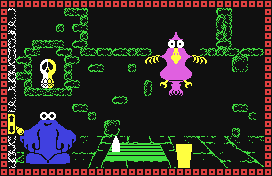 Before you send it to the "Thing" by tripping the lever (14), you should try to prepare the "Boiled Slimies" and "Crushed Eyeballs", as otherwise the time in the game might get tight. Fetch the yellow cup (5) from the kitchen and empty it, a box with seeds will fall out. Bring the box into the room with the three flower pots (18) and empty it there. You get three small eyeballs. Place each one eyeball in the pots, the plants start to grow. While they grow, push the barrel (7) in the kitchen to the wall next to the stairs. 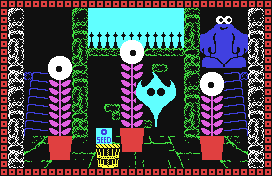 The plants should now have three big eyeballs as fruits. Now throw all three into the barrel (7). Place the bottle from the kitchen (2) below the barrel's outlet. Now open the trap door and free the green jumping monster. Place the cauldron so the monster jumps inside and crushes the eyeballs. Take care that the bottle stands below the outlet! Send the now filled bottle to the "Thing" with the lift. Open the trap door so the monster can jump back in. Take the yellow cup (5) where the eye seeds had been outdoors. Catch four Slimies (the slimy things that hide in the mud) and put them in the cup. In the kitchen, go upwards onto the balcony. From there, empty the Slimies from the cup into the cauldron (3). Now push the cauldron in front of the lift (15). Let the green fire-breathing monster out of the trap door. Now place Berk in front of the cauldron and wait until the creature stops at Berk. Step aside now or you will be roasted. The monster heats up the cauldron and it starts to boil, this shows that the Slimies are boiled. Move the cauldron to the lift and send it to the Thing before the Slimies get cold. To get rid of the monster lift the weight (16) with the switch (17) and lure the monster below the weight. Drop the weight. Let the big bird out of the trap door. Take the basket (1) and empty it, a small bottle similar to a projectile will fall out. Take these and place it on the trap door. Fetch the pan (6) from the kitchen and put it in the room with the trap door. When the bird flies over the trap door, shortly open the trap door so that the bottle hits the bird. Instantly close the trap door again or otherwise the bottle will be gone! If it happens nevertheless, you can also use Boni as a missile. When hit, the bird gets big eyes and flies to the right into the next room. Take the basket (1) and hold it below the bird, it will lay an egg. Put the egg into the pan (6). Repeat this until the bird does only fly over the trap door to an fro. Open the trap door to let the bird in. Take the pan and place it on the oven (13). When the pan is hot (flashes) take it from the oven, Berk will drop it. Wait until it does not flash any more and send it to the "Thing". Now we tidy up. Simply throw everything, but really everything, including Drutt and Boni down below the trap door. There must also be no ghost or worm any more in the castle. The "Thing" will now send the safe with the lift. Raise the weight (16) with the lever (17) so far that it hangs at about 3/4 of the screen height. Place the safe below it and drop the weight on it. Only if the weight has had the right height, the safe will spring open. If it was too high, the safe will be squashed, if it was too low, the safe stays closed. H.T.W: "The idea is good, the game is already almost cult, the moster is funny and at the beginning everything looks lovely. But if you play for a longer time, the extremely jittery animation of Berk and the notchy controls are disturbing (until you have found the right place for Berk to move an item you will have turned old). The "puzzles" are quickly solved with the help of Boni's tips and as there are actually only four tasks to do - tidying up and opening the safe are not really tasks - the game quickly loses its fascination. What is left is a "really different" action adventure, which can definitely be interesting for some time, with an evaluation at the end." Nessie: "A really different action adventure, the game only got cult because the TC series in England also was cult, but the main actors look good in the game and the rest of the monsters are also rather crazy." 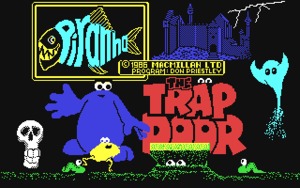 The game is based on the British childrens' series The Trap Door.